This Latin American airline pays a decent dividend today, which looks set to rise over the coming years. What's the only thing better than a rising stock that delivers a reliable dividend? How about a dividend that rises along with the share price? I think that's the most likely scenario we're looking at with Latin American airline Copa Holdings (NYSE:CPA), which currently pays a 1.8% dividend on a stock that's trading at two-year highs. But what's really appealing is that this dividend should begin to increase as Copa's business continues to recover from what has been a very tough couple of years. For a long stretch, Copa's stock seemed to defy gravity -- growing from around $30 in 2009 to over $160 in late 2013. The party ended shortly thereafter, when economies in some of its most important markets -- notably Brazil, Colombia, and Venezuela -- began to weaken, causing passenger demand to drop dramatically. As a result, in 2015 and 2016, Copa suffered from falling revenue, weaker operating margins, and lower net income. While the company's stock fell all the way back into the $40s, Copa's dividend during this difficult time was at least a little more stable -- paying $0.84 per quarter in 2015 and $0.51 per quarter in 2016. And the company has already declared it is holding its dividend steady for 2017 at $0.51 per quarter. Copa's dividend policy is to pay out 40% of the prior year's annual net income in equal quarterly installments. One benefit of this is that at the conclusion of the year, shareholders know what their dividend payments for the following full year will be. However, it's also worth noting that management has made a couple of adjustments to this formula recently -- both of which were in shareholders' favor. First, in late 2015, Copa tweaked its payout policy so that it paid out 40% of the previous year's adjusted net income, rather than simply reported net income. This insulated shareholders from the effects of a large, one-time Venezuelan currency translation and transactional loss that resulted in negative net income for that year, allowing the company to still pay a dividend in 2016. Second, after announcing its full-year 2016 results, the company decided to go slightly above the 40% payout figure so it could maintain its dividend at $0.51 per share throughout 2017. Given the company's solid financial position (a net debt-to-EBITDA ratio of 2.2, the lowest in Copa's peer group), this seems like another smart, shareholder-friendly gesture. 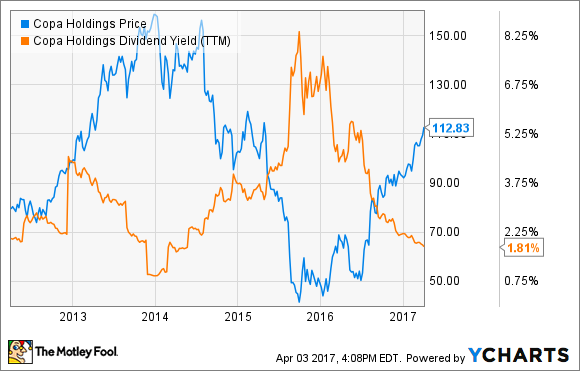 A dividend that should rise next year -- but by how much? Even during the darkest days of 2015 and 2016, Copa managed to redeploy some of its capacity from low-demand routes to high-demand routes while keeping its costs in check, allowing it to post operating margins of around 12%. And although the stock certainly suffered, the business performed admirably under the circumstances. For these two years, holders of the stock continued to collect a dividend yield of at least 2%. Only recently has Copa's yield dipped below that threshold, owing to its share price rising dramatically again as investors cheer the company's rising prospects. Copa has already returned to positive revenue growth, and passenger counts have now risen for five consecutive quarters. As local economies continue to stabilize across Latin America, management's outlook for 2017 is much improved: The company is guiding for mid-single-digit capacity growth, as well as higher revenue per available seat mile (RASM) and higher operating margins back near its historical norms. With the lowest unit costs of any of the major airlines in its markets, the company appears to be in a very good position. With the wind now seemingly at Copa's back, analysts, on average, are currently predicting earnings per share of $7.67 in 2017 and $8.64 in 2018. Under the company's current dividend policy, those figures would result in quarterly dividend payments of $0.77 in 2018 and $0.86 in 2019, compared to the $0.51 quarterly dividends being paid out this year. That sounds like a very attractive outcome to me, particularly if Copa's business continues to rebound in a big way, resulting in further share price appreciation as well.